The online poker scene is bursting with opportunities for players of various skill levels. 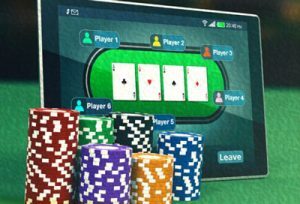 If you throw yourself into the vast sea of online poker sites, you will soon find that each of them offers plenty of online poker games to suit everyone’s taste. The first thing to do when you’re starting your gambling adventure is to take your time and carefully choose the game you are going to dedicate your time to. Here, we offer you a guide to help you devise the best winning online poker strategy, as well as learn how to play online poker and start winning at this classic game of skill. We know what it is like to look forward to a new experience when you can’t wait to showcase your poker-playing skills. However, even though the online scene offers attractive multi-table tournaments and high-stakes games, we advise you to start small. There are numerous online poker games that you can play with low stakes, as well as some free-to-play variants where you can practice your strategies before sitting at an online tournament table. And only once you gain the knowledge and confidence needed for some serious grinding at an online poker table can you start playing some serious high-stakes poker and begin winning real money. Playing live poker in a regular casino is a whole different ball game than playing poker online. The entire point of online gambling is that you can play your favorite games and earn money from the comfort of your home. However, the setting of an online poker game is somewhat different from the one you are used to. One of the online poker strategies that go a long way tells you to practice playing at an online casino before taking a seat at the real-life poker table in a land-based establishment. However, there are some new features in online poker play that you first need to get familiar with. One of these is certainly the time bank, which allows you to take additional time to make a move. Moreover, there are also many online tools and apps devised to help you make the right decisions and win the game. Some of these features enable you to study your rivals and their moves during a game so that you can adjust your online poker strategy to beat them and take the pot. However, there is also a more complex software that deals with the game and the statistics. Seasoned players often use this to study their rivals’ hands and gain some advantage over them in the game. If you are not someone who only came to check out what online poker playing was like, listen up. If you want to learn how to play online poker games to win big, you should dedicate most of your time and energy to mastering a basic game strategy. Although, the only way to do this is to constantly play different online poker games and to learn from every one of the thousand hands you’ve played. And once you are at the right table, you need to stay focused to be able to successfully apply all the things you’ve learned. What is more, when in the middle of a hand, try to focus on the cards you have. Then, try to think of the range of winning combinations your hand may offer before deciding whether to continue playing or fold. Good bankroll management is an essential skill to master if you want to be successful at this classic table game. Hence, you can start with modest bankrolls in micro-stakes games, but once you go big, you have to play with a considerable bankroll to survive possible losing streaks. Fortunately, there is an appropriate online poker strategy for every game that you can use to save your bankroll from breaking. Poker tournaments represent the ultimate poker playing experience. They can last for hours, and as the stakes get higher, the bankrolls get slimmer. Here is an online poker strategy that will lead you to the final table without busting. You can play loose at the opening stages of the tournament because the chip stack is still high. You can use this to be aggressive and chase out the weak and recreational players. If you get to the middle stage of the poker tournament, adjust your playing style to the number of hands you can afford to play. If you have less than five hands left to play, go for all or nothing with a strong hand. On the other hand, if you don’t have an outstanding hand — fold. If you have enough gambling money in the mid-part of the tournament, you can play loose even with mediocre hands and hope to make other players fold. When you’re holding a strong hand like an Ace and a King or a top pair, at the very beginning of the game, in the pre-flop stage, play the so-called 3-bet. This means you should start by reraising and waiting for the flop to open to complete the winning combination. This way, you will force your opponents to follow and to build up the pot while sending a strong message. There is something called a combo draw in Texas Hold’em. This is a favorable situation where the player has an opportunity to complete different hands by combining their cards with the cards from the flop. The most common hands you can expect to form in combo draw are a flush draw and a straight draw. Here, there are 15 possible outs, i.e., 15 cards in the deck that can help you get one of those, so if you are in this situation at a Texas Hold’em table, don’t be afraid to raise. We have already mentioned how important it is to stay focused and collected during an online poker game. But to be able to achieve this, you have to provide optimal playing conditions. Get a room with no distractions — only you, your computer, fast Wi-Fi, and a lot of light. The game of poker may bring numerous ups and downs. However, winning poker players manage to stay calm and stick to their online poker strategy, even when the times are rough. They know it will pass eventually. However, if you feel like you’re about to tilt, sit out a few poker hands. Grab something to eat or stretch a little. Do whatever helps you clear your head. And when you’re ready to continue, get back into the game. This guide may not turn you into Phil Ivey, but it will definitely help you find your way in the irresistible world of online poker playing. It will also help you make a winning online poker strategy. So make sure to read this before you hit an online casino and test your poker skills.